Welcome! The lobby of the Deranged L.A. Crimes theater is open. Grab a bucket of popcorn, some Milk Duds and a Coke and find a seat. 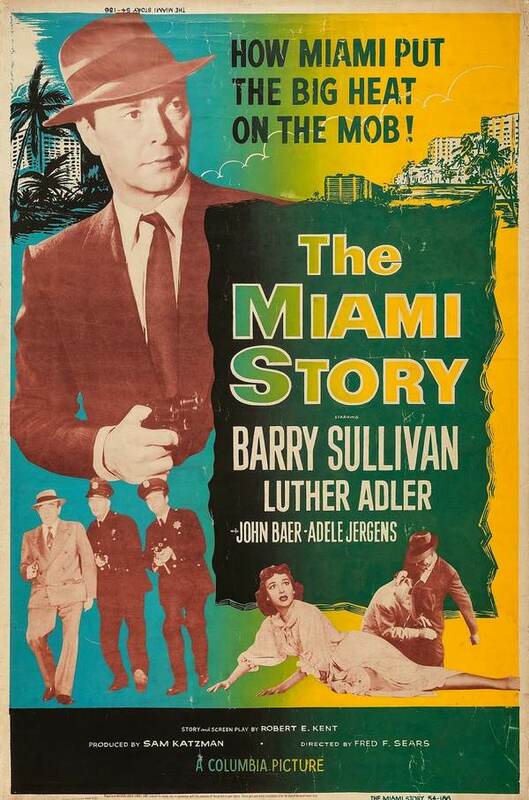 Tonight’s feature is THE MIAMI STORY starring Barry Sullivan, Luther Adler, John Baer and Adele Jergens. Before the main feature I’ve added a special short subject, courtesy of the Los Angeles County Sheriff’s Department. Please don’t try these shooting stunts at home! In post-World War II America, a rise in gangster activity prompts the formation of an investigative committee by the U.S. Senate, forcing many criminals to flee to the safety of the tourist-filled and ineffectually policed Miami. When two Cuban gangsters are gunned down upon arrival at Miami’s airport by gangster boss Tony Brill’s right-hand man, Ted Delacorte, and police chief Martin Belman is unable to secure an indictment, journalist Charles Earnshaw summons several prominent Miami businessmen for assistance. The men are dubious about stopping Brill’s ruthless criminal machine, until attorney Frank Alton suggests a plan.